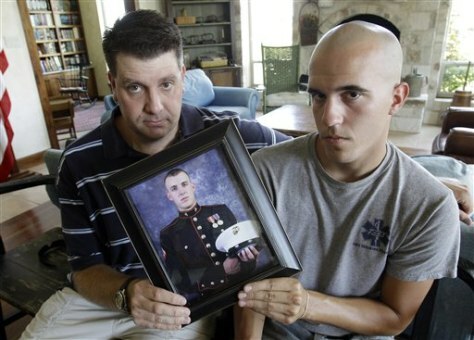 Jonathan Leicht, left, and Jesse Leicht pose with a photo of their brother, Marine Cpl. Jacob Leicht, Saturday in Kerrville, Texas. Their brother was killed while on patrol in Afghanistan on Thursday, making him the 1000th U.S. serviceman killed in the Afghan conflict.